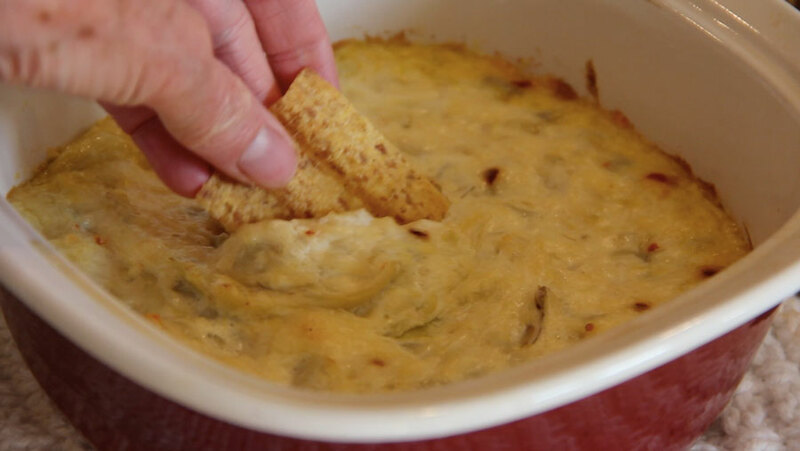 Learn how to make Belle’s Parmesan Artichoke Dip in the video above. I love to cook for family and friends and it seems when everyone arrives at my house, they always congregate in my kitchen. This is fine, except it means I’m having to navigate around a crowd. That is why I love my spicy parmesan artichoke dip. It is so flavorful and no one can resist it. I mix this up and have it hot and ready for my guests when they arrive, keeping them completely focused on this delicious appetizer and completely out of my kitchen. Serve it with crackers, veggies, or pita bread, and have it on a table just outside the kitchen. Drain and chop the artichokes hearts. In a bowl, mix together the mayonnaise, cheese, and red pepper flakes. Stir in the artichoke hearts. Spread in an 8×8 inch baking/serving dish and bake in a 375 degree oven for about 20 minutes or until the dip is hot and bubbling and is lightly browned on top.